Isaac Webb, project lead for Access to Headington project gave a progress update to local councillors. A gas main had been discovered* at the Marsh Lane junction, thereby disrupting works and causing about a two-week delay, although they are expecting to make time up elsewhere with works that are easier to install. Temporary traffic lights will be on when work to finish junction kerbs are underway – they are removed overnight. At the moment 24thJuly is the date for the change in direction of traffic that runs in front of the shops. 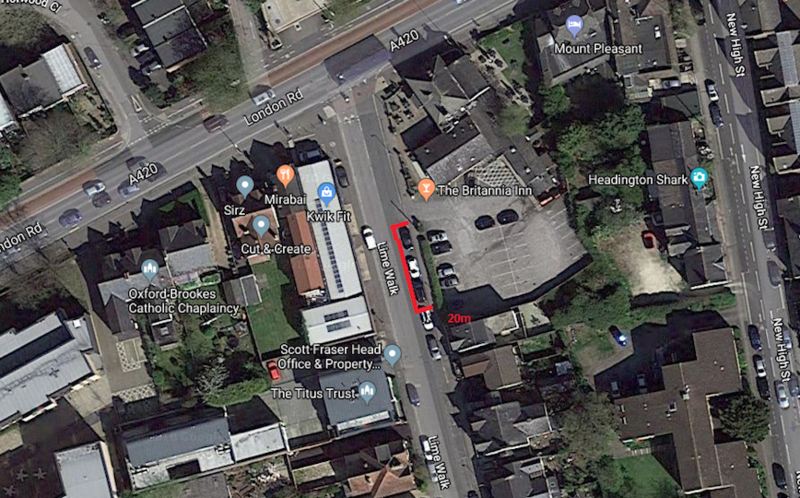 The JR junction works are on hold, with works planned to start at the top of Headley Way working their way on one side of the road towards the JR junction. These are due to start week beginning 25thJune. The advisory cycle lanes have been masked out; note I asked for the cyclists’ dismount signs to be removed as not necessary! Safety through works has been an issue, e.g. jumping of red lights but no serious incidents have been reported. 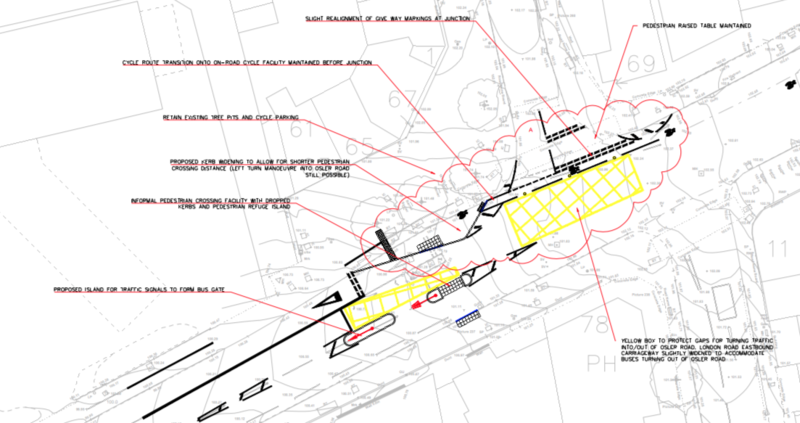 I enquired when the Old Road continuous cycle lane works will start and is this still in the project. It is still in the scheme, will possibly be a priority next year. I also asked about the promised 20mph consultation for Windmill Road. The consultation is not part of Isaac’s remit and will depend on the highway safety team. I will continue to chase! Please note that the dates given are subject to change – e.g. finding another unrecorded utility pipe! We have just been advised by County that..
For awareness, the forecast has been updated this morning for heavy rain overnight so tonight’s closure/works is being cancelled. We have received the following notification and map from the County Council. We’ve just received some answers to further questions raised at last night’s Headington Ward Focus meeting from the project team. Here they are. Is there enough space for a buggy on the crossing island? Can there be CCTV enforcement to ensure drivers observe yellow boxes? Down the line – possibly. The council is seeking powers to do this but is currently not able to do it. At present only TfL have been granted delegated powers to enforce yellow box infringements which are otherwise the preserve of the police. We’ll have a qualified ecologist checking every tree to be felled, if it has an active nest we can’t touch it until the nest has been proven vacated. Those cyclists not wanting to use the road can still legitimately use the shared facility on the uphill section which would avoid this risk. Here are the answers by councillors to questions raised at yesterday evening’s Headington Ward Focus Meeting about the new crossing. Why introduce it at such short notice? Who comes up with options for road crossings? Amec Foster Wheeler provide alternative options and explain which ones are most feasible in their view in response to a spec from the County Council. A broad one. Controlled or uncontrolled crossings, either directly across the road or staggered. Does the County Council have to go with the Amec recommendation? Was money a factor in coming up with an uncontrolled, rather than a controlled, crossing? Original provision showed a toucan crossing incorporating the bus gate, after developing the design further it was determined that a controlled crossing could not be delivered safely. Alternatives were considered, including a zebra, which had similar safety concerns. Will the crossing be used by cyclists as well as pedestrians? It is first and foremost a pedestrian crossing. It would technically be possible for cyclists to dismount, use the crossing and then resume cycling in the cycle lane opposite. Letters to The Occupier at addresses in London Road between the garage and the controlled pedestrian crossing/lights have been sent by a distribution company. Councillors are concerned about this as not all tenants in flats above shops may see the notification. We are also concerned that people in Osler Road, New High Street and Lime Walk have not been circulated, and we shall contact these residents ourselves. Have the bus companies been informed? Will this affect community projects? Will any trees have to be taken out? Where will construction space be? Will there be works at weekends? Your councillors called for the introduction of a safer pedestrian crossing at this point in the initial consultation, but were hoping that a controlled crossing option could be found. 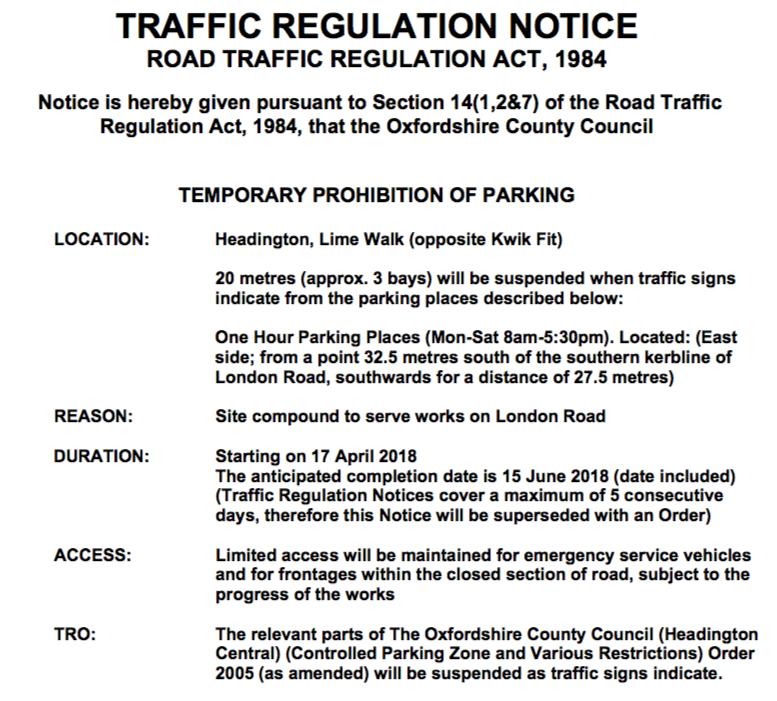 Traffic will be slow in the centre of Headington during April. We are concerned that there has been insufficient notice given to those affected although we understand the reasoning given, and we feel that residents in adjoining roads should have been leafleted. However we welcome much-needed safety improvements for pedestrians at such a busy location. We have just received this information from the County Council. You will all no doubt be aware the Oxfordshire Growth Board announced the Year 1 growth project allocations yesterday and A2H received the full monies asked for. The announcement came a week earlier than we were expecting, it means that the Headley Way works will be continuing as originally scoped. I will update you with more information when I have it but the intention will be to start the Headley Way works after Easter, an Easter start would then have the programme running to Christmas 2018 (weather permitting). We will start at the Marsh Lane roundabouts as per our original programme but the programme at the JR access will be changed as we’ve managed to do some early works in advance that should reduce the disruption there. As before, we will be undertaking a pre-construction exhibition at a location/time TBC. There remains a broad local support for pedestrian provision in this location but bus companies are understandably concerned that the changes may affect the level of bus priority they receive with this latest proposal and we’re engaging with them to mitigate their concerns. We will be looking to start the work as soon as possible, taking advantage of the Easter holidays if at all possible. It’s envisaged that the work would take 6-8 weeks given the site constraints. We will be publicly advertising the attached shortly and will advise of the programme of works and TM phasing once approved by network management. We are checking that works to trees can be done at this time, bearing in mind that this is the start of the nesting season. The following statement was sent today by one of the County Council transport planners in response to queries about the validity of the Access to Headington improvements. We display it here for the benefit of residents. The same paper also confirmed that alternative roundabout designs were considered early in the design process for the Marston Road/Headley Way/Marsh Lane junctions. However, detailed modelling confirms that these designs would still cause large queues and delay, whereas junction modelling of the proposed signalised arrangement estimates that total vehicle delay and queuing will be significantly reduced. As a result, more of the junction’s capacity can be given over to prioritising buses through selective vehicle detection, cycle safety can be improved with the introduction of cycle pre-signals, and additional controlled crossings for pedestrians and cyclists can be installed, without having a negative impact on general traffic. In terms of the bus-link at Northway then this was planned for local bus services only given the roads in Northway are narrow and the route to the JR Hospital less direct than the B4495, which also serves more destinations. Furthermore, the Access to Headington aligns with the Oxford Transport Strategy (OTS), which proposes a series of projects that look to address citywide connectivity on Oxford’s orbital and radial routes, with proposed improvements on the B4495 delivering the first phase of infrastructure needed to achieve rapid transit and cycle networks as set out in the OTS. There have no changes to the OTS since Access to Headington was planned, design and consulted on which would require the scheme to be re-considered. The County Council is still waiting for additional funding to be approved. In the meantime they are still looking to get preparatory works completed to reduce the level of disruption when works start in earnest. With that in mind they want to continue some off-peak working on the islands outside the JR access on Headley Way. Working off-peak weekdays (Mon 12 Feb – Fri 16 Feb) 9:30 – 3:30. This will take advantage of the reduced demand due to half term and mean they get the most difficult pieces done when fewer people are travelling. A temporary roundabout will be reinstated after works are completed. Significantly less work has been going on over the last few days. Overnight temperatures need to be higher in order that materials can properly cure and allow the line markings and anti-skid to last as long as possible. The Growth Board met yesterday in closed session. Although the Access to Headington project was not referred to on the agenda, it was discussed under an item with a different portfolio name. We understand that individual projects are not likely to be announced till the 7th February. So the planned and published Staunton Road closure may still go ahead. We have gathered the following information from discussions today with the County Cabinet Member and the project lead for A2H. it is possible that some of the elements of the Access to Headington scheme may have to be de-scoped (this means that they won’t be funded from the existing pot and will be dependent on funding from elsewhere if they happen at all). the County Council does not have to hold a statutory public consultation should any changes to the Access to Headington works be deemed necessary but the officer’s view is that there is a moral obligation for the County Council to consult residents once the options are agreed. We have informed the County Council that the condition of the JR roundabout is deteriorating and have asked this to be safety checked. There is no correlation between any national media stories about Skanska and the quote for these works.